When your retention isn’t great across the board, it’s easy to get overwhelmed and discouraged. Because everything looks bad, it’s hard to find a point of leverage where your efforts will markedly improve retention. You lose nearly 75% of your users within the first week, and by the end of the month, you’re down to 6% of your registered users. By the end of 3 months, only 4 out of 100 users are left. 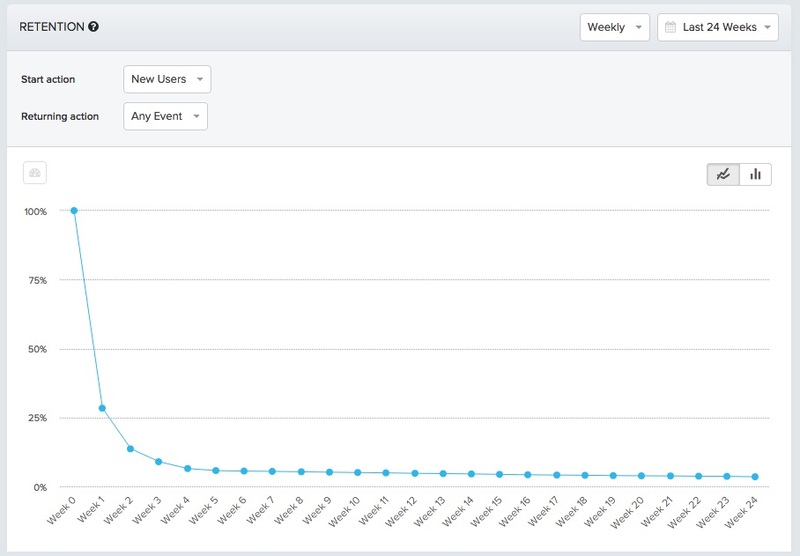 Look closely, though, and buried in this graph you’ll see a really positive sign—by Week 10, your churn has flattened. From then on, you’re holding steady on retention, even if it’s only at 4%. That means that your product has traction, and you’ve built real long-term value, even if only a very small set of people see it right now. Now you have your target: improve that 4% number. Get it up just a smidge to 5%, and you’ll increase revenue by a whopping 25%. Push it even higher and your business will start to take off. But the best way to do it isn’t what you probably expect. To make the biggest impact, you’ll need to avoid the temptation to hone in on the user experience starting at Week 10 and make short-sighted product changes, building new features from scratch. It’s surprising, but one of the biggest determinators of where your churn flattens out to in Week 10 is the first impression you make in Week 0, during user onboarding. That’s why it’s likely that the best, most effective use of your team’s time is to go all the way back to Week 0 and work on getting users off on the right foot with your product. It turns out that when you improve user onboarding by following best practices, you get massive leverage and the changes you make will provide lift throughout your entire retention curve. As a framework to think about retention, billion-dollar SaaS marketing provider HubSpot breaks retention down into three phases. This helps break down the multifarious, daunting problem of improving retention. At each step, HubSpot focuses on getting users to do one thing. This helps reduce the problem down into separate pieces, but notice how each phase of retention isn’t independent. To establish a pattern of usage, you need to get the user to use the product more than once. For the user to consider the product an indispensable part of their workflow, they’ll need to have established a pattern of usage with it. That’s why one of the best ways to get more users to rely on the product as an indispensable tool is simply to get them using it more than once. In addition, notice how the biggest drop-off in usage happens during the short-term retention period between Week 0 and Week 1. 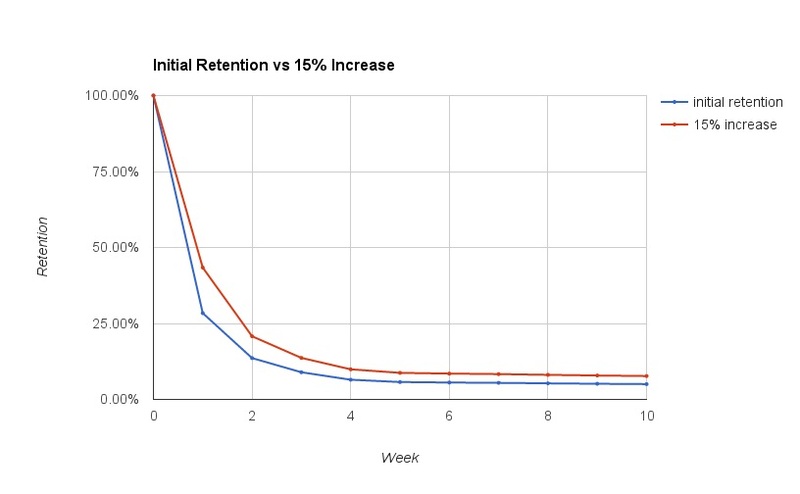 It’s an often-seen retention curve, where retention drops nearly 75 percentage points down to just above 25% in a single week. In contrast, by just Week 3, you see a single percentage point drop between Week 3 and Week 4. There’s much more room for improvement early on, such that small changes in user onboarding will have a massive impact in that week, and the weeks to follow. Improve user onboarding to get more early usage, and you’ll see the benefits cascade over time. In his talk at Price Intelligently’s conference entirely devoted to SaaS—SaaSFest— Dan Wolchonok, Head of Product and Analytics at Reforge, described how improvements to the user onboarding in HubSpot’s Sidekick product proportionally increased the number of users using the product at every week in the customer lifecycle. User onboarding improvements drove Week 1 retention up to 75% from the 60s. Week 2 retention maintained that difference as it was up to the 60s from 50%. By Week 10, 25% of users were still using the product—rather than having only 10-15% of users actually active. 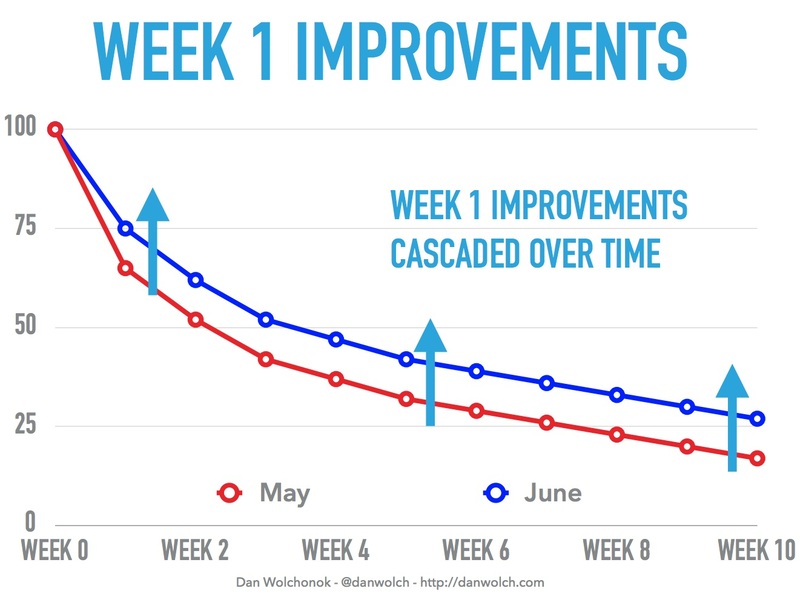 If we go back to our first example and introduce a ~15% increase in Week 1 retention, like that seen at HubSpot, to the data, and change nothing else, that 15% boost cascades throughout each week, adding 50% more users throughout each week than we initially had. Awesome, right? It gets better. This small increase in Week 1 retention and the proportional increases it brings to your user baseline translates into significant gains in revenue throughout the entire period. Assuming that user retention is proportional to revenue retention, if you started with 1,000 users in each cohort, charging each user $5 per week, then instead of making less than $1,500 in Week 1, you’ll now be making over $2,000. Then each week you are making 50% more revenue. This continues on and on and on, with your baseline of users bumped up adding more revenue week on week. With retention plateauing at ~8% instead of 5%, you’re making over $100 more per week because of some simple changes made in Week 1. What’s more, you’ve been making more money throughout the entire period. If you were to sum up all the revenue available under the blue curve above you’ll have made $20k from these users within a year. With onboarding improvements pushing Week 1 retention up, you’ve instead made $28k in revenue from the cohort that year. You see a 40% increase in revenue by making what users did in Week 1 just 15% better—2.6x what you put in. This lift to revenue applies to all the new users you acquire, to boot. In fact, long-term retention is so strongly related to what happens during the onboarding period, that you can often predict whether a customer will stay with you based on what actions they take or don’t take in their first week. At Facebook, their growth team split users into two groups: those who became engaged users—using Facebook day after day—and those who didn’t, and they discovered something surprising. 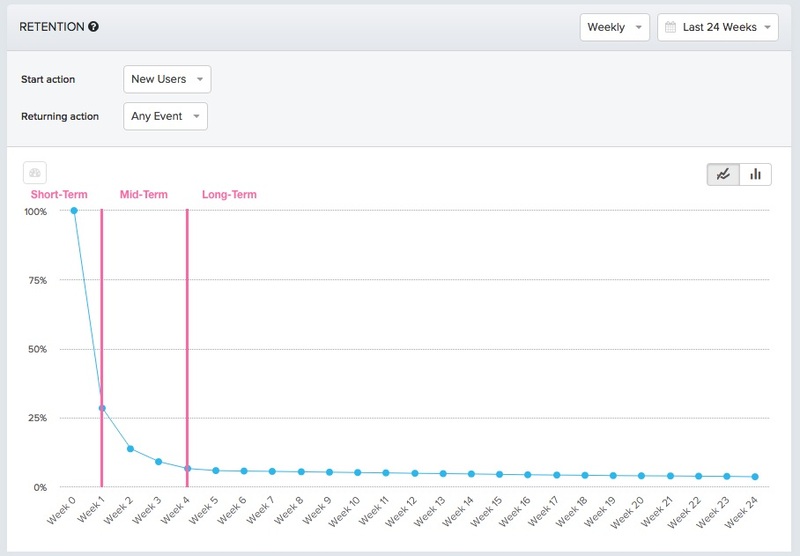 Engaged users had added at minimum 7 friends within the first 10 days of signing up. In other words, they were able to predict a user’s future based on what happened within a very narrow time frame immediately after signing up. That metric became a very powerful driver in aligning everyone in the company towards getting new users to add 7 friends as quickly as possible during onboarding, and that powered the growth engine that took them to 1 billion users and beyond. This all comes down to your product’s core value. If a customer can understand the core value of your product immediately—seeing how it’s going to help them as soon as they open it up—then they are far more likely to continue using the service for an extended period. If that core value isn’t directly obvious, then they’ll log out and never return. That’s why you see such rapid drop offs in retention in the short-term phase—people can’t find the value and churn out immediately. But get that core value delivered quickly, and that strong first impression sticks with them, carrying them through to the long-term retention phase that can last years. User onboarding is entirely about getting to that WOW moment as soon as possible. This makes for a better experience for your users, and more customers and increased revenue for you. Ironically, it’s typically not obvious what your own app’s WOW moment is. At Facebook, it seems evident in retrospect, but the WOW moment could’ve been 7 status updates in 10 days, 10 likes in 10 days, or any number of other interactions on Facebook. For most apps, your WOW moment is something that you discover by observing and understanding user behavior rather than being something that you prescribe to your users. In building your app, you probably have some idea of the core value of your product, but how you see your product and how your customers see your product can be two very different things. Define your performance metric: What does success look like? We’re focused on long-term retention, so our performance metric could be Week 10 retention. We want to find what user actions correlate with high Week 10 retention numbers. Lay out all the user metrics you’re tracking during the onboarding period: For each user, you’ll have their performance metric in a row with other user actions, like logins in the first 15 days, and app-specific user actions like messages sent in the first 15 days, status updates in the first 15 days, contacts tracked in the first 15 days, and more. Run the regression: Regression analysis is a way to estimate the relationships between variables—it will tell you which of your user metrics most strongly predicts success according to your performance metric. Running a regression and determining the correlation coefficient between user behaviors and retention sounds complicated, but it’s actually pretty straightforward with calculatorsavailable to do the hard work for you. 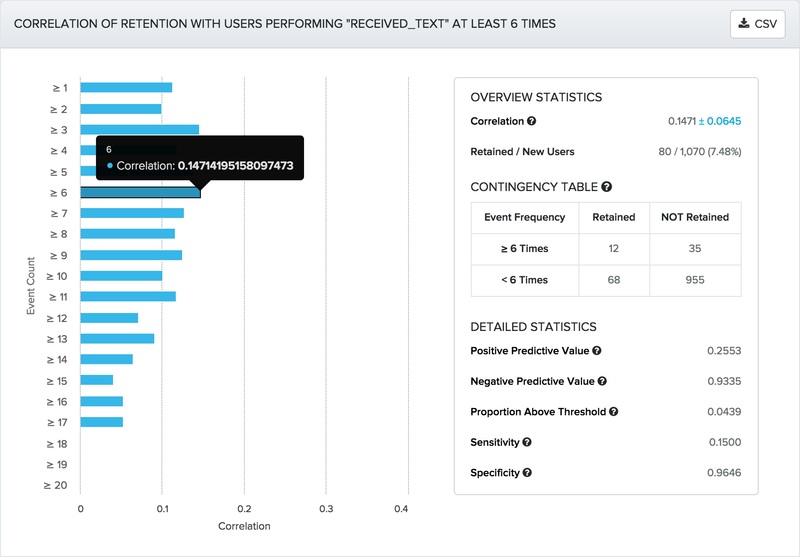 In addition, Amplitude, an event analytics service, makes this process easy by allowing mobile developers to track events in the app and then look at the correlation between specific behaviors in their app and retention n days later. Suppose your app is a website uptime monitoring service like Pingdom. By running this analysis, we can see that receiving a text 6 or more times (the behavior) is positively correlated with long-term retention. It may seem like a small correlation at only +0.1471 (correlation runs from +1, perfectly correlated, to -1, perfectly negatively correlated) but any positive correlation means that this is part of the puzzle. Correlation is a measure of how two numbers are related to each other, in this case receiving a certain amount of texts and the number of people retained. The blue +/- 0.0645 shows how confident you can be in your number. The closer this is to 0, the more likely your correlation calculation is on the money. There are a few other numbers here that will help you identify your WOW moment and help move people towards it. In particular the Positive and Negative Predictive Values help you assess whether this behavior is something to push people towards. In this case receiving 6 texts has a PPV of 26% and an NPV of 93%. A PPV of 26% means that receiving 6 texts leads to the person being retained 1 in 4 times, which makes for a pretty solid foundation for building further retention. What’s more, an NPV of 93% means that people not exhibiting this behavior are almost definitely going to churn, lending further evidence to the need to get people receiving the texts. Lastly, the Proportion Above Threshold number shows how many of your users overall are already exhibiting the behavior. In this case a low number, such as the 4.3% here, shows that there is still plenty of room to maneuver with this particular behavior, and you can drive more people towards this moment. Once you have an idea of what WOW moments are, you can start experimenting with bringing them to your users attention during onboarding. This is absolutely critical, because correlation does not equal causation. With (1), you can probably guess that users who use the app will use the app more than people who don’t use the app. However, the question is what will happen if you emphasize your onboarding flows to get people to set up text messaging and find ways to notify them 6 times within the first 15 days. If you see that results in an improvement to long-term retention, then you can say that receiving 6 or more texts actually causes people to stick around. On the other hand, emphasizing text messaging may obscure a different feature, such as setting up performance visualizations on your app uptime. In this case, your changes could actually cause long-term retention to decline. By experimenting with your onboarding flow, you can work out where you need to drive your users early on. For instance, if your web experience shows a dashboard allowing users to track their app’s uptime performance, landing them straight on to this page could be confusing. What are they supposed to do? Where are they supposed to go? This is where users get intimidated and leave without performing a single action. That’s why so many users drop off from the first-time app experience without doing anything and never return. But if from your regression analysis you knew that immediately checking out the uptime statistics was positively correlated with retention, then you could use a cue to drive people to this feature as soon as they logged in for the first time. Now users will know that this is where they want to be looking for any core value. This is where spending the time looking at the data and running the analysis pays off. Bad onboarding will flood those first screens with multiple cues, pointing out all the cool features to new users. They won’t have a clue what the important ones actually are. By drilling down to these core values via retention analysis, you can find the one that really drives retention and focus 100% on that. Then you can track these users and compare their long-term retention versus other users who haven’t had viewing the visualizations emphasized. When people first sign up for your product, they’ll either get it or they won’t. They’ll either understand the core value and go “Wow!” or shrug, drop your app in the trash bin, and forget about it forever. The users that go “Wow!” are the ones that will still be using your product weeks, months, and years later. They’re the ones who will spread the word with friends and colleagues. That’s why user onboarding is so crucial, and can have such an outsize snowball effect on growth—it allows you to unlock the inherent value of your product, and make it click for more users. Get the first few moments of your product right and your customers will stand by you, paying you through those weeks, months, and years. Just a small improvement right from the start has drastic effects further down the line. By increasing retention a couple of percentage points, you can double your revenue only a few weeks later—and the easiest way to get there is through better user onboarding. Get users to that WOW moment now, and you’ll reap the rewards well into the future.